The Borders bookshop chain in the UK has appointed advisers to try to find a buyer for the business. Reports have said WHSmith walked away from a takeover deal on Friday, and that Borders UK could go into administration soon without a sale. 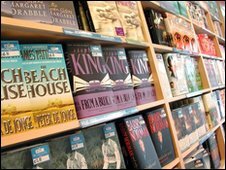 Waterstones owner HMV is thought to be one of the firms in discussions to buy some of the chain's stores. Borders is reportedly concerned that it does not have enough cash to see it through until Christmas. The chain, which also owns Books Etc, has suffered from increased competition from online retailers, such as Amazon, as well as supermarkets. "These stores are losing money even in the run up to Christmas because of the heavy discounting," Nick Hood, from the insolvency practitioners Begbies Traynor, told the BBC. "The real problem here is the lack of credit insurance which means they can't get supplies - it is the same problem that Threshers had." Credit insurance is usually taken out by suppliers as a way of ensuring that the business will pay for the goods. The UK arm of Borders was bought in July by the private equity firm Valco. It was previously owned by Risk Capital Partners - headed by the Channel 4 chairman Luke Johnson. Clearwater Corporate Finance is acting as an adviser to Valco in the sale of Borders UK.